I know I’m late. I could just skip Thanksgiving. But that wouldn’t be right. I mean I’m the person who insists that Christmas begins the day after Thanksgiving. Under no circumstance should anyone even consider decorating for Christmas until after Thanksgiving. You can’t skip Thanksgiving. That’s un-American. So even though it’s late, we didn’t skip Thanksgiving. I’m late, but still thankful. And I want to write about it. This year has been hard. But we’ve survived. We’ve thrived even some days. In our crazy life that’s basically a miracle. And I’m so thankful and grateful for all of it. This year we learned to adapt, to change, to do things our own way when THE way didn’t work. Thanksgiving was no different. We planned to go to Memphis and spend Thanksgiving with my family. That didn’t happen. I bought stuff to make Thanksgiving shirts, but we didn’t do that either. You see, even though the boys are getting older and bigger, they’re still preemies. They still have preemie lungs. And they still get really sick when they get sick. Someone in my house has been sick every single day for the last month (not me luckily, although I wish I could take their place sometimes). In fact, the boys went to school 1 day this week and Addison is home sick today too. Last week it was Logan. Poor Logan got RSV. He almost ended up in the PICU because he was really sick. RSV is a respiratory virus. If I had it (which is likely) I would just have cold symptoms. 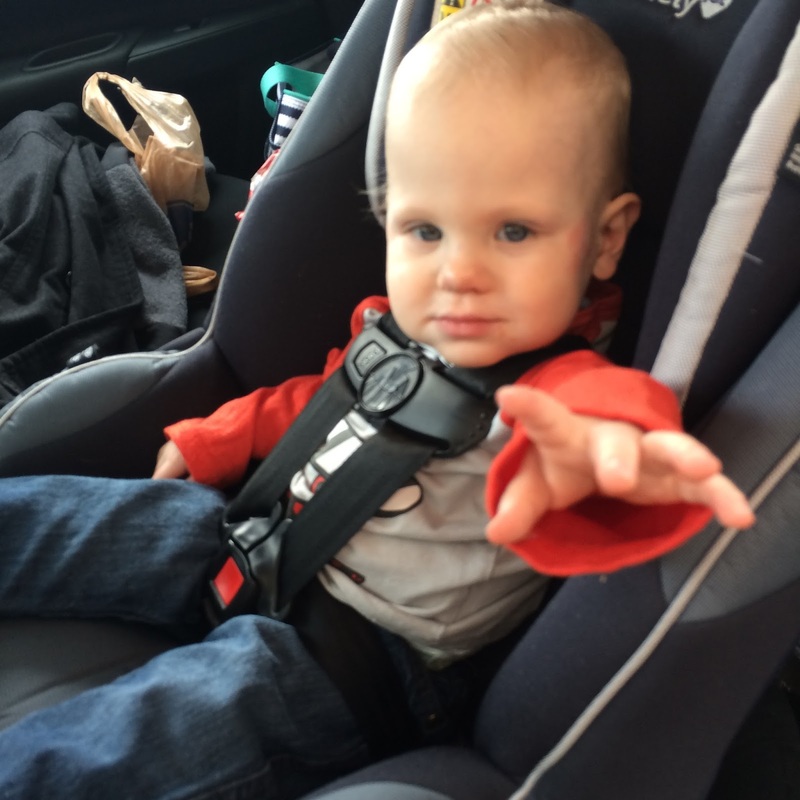 Logan needed oxygen, an iv and a feeding tube. He spent 6 nights in the hospital. And he came home on Thanksgiving. That’s all I wanted for Thanksgiving this year. When life is crazy, it really helps me to take a step back and focus on the simple things. Those are the things I’m thankful for this year. My kids. Nothing makes me happier than 3 giggling babies and a laughing, dancing 11 year old. Many days I think (and say) that I have way too many kids. Maybe I do. But maybe I have just the right number. Kids make me smile, they make me laugh, they make me shake my head and say wtf, and sometimes they make me want to pull my hair out. See below for other things I’m thankful for that help with this. But mostly, I love them more than life itself and I’m so thankful that I get to be their mom. Brian. Yep super cheesy I know. But Brian is a great dad and a great husband. Brian is the reason my house is clean, the reason I eat, the reason I have time for everything I do. And, huge bonus points for Brian because he mostly ignores my crazy and lets me be me. Friends. I’m thankful for my friends near and far. My friends make me laugh, they love me for me, and they care. This means more than I can ever express. I’m not good at sharing my feelings so I may never tell anyone to their face, but I’m so thankful for my friends. Even, and especially, the friends who come spend time with me when my kids are in the hospital and reschedule our dinner dates to the hospital cafeteria and “accidentally” lick the crib of the sick baby. And my triplet mom friends who talk to me all day long every day, and who spent hours upon hours making me laugh when Logan was sick. And sent me food when they found out I was living on coffee and the granola bars I found in my purse. I consider myself very lucky to have such great friends who love me for me even though I’m a little mean, I’m OCD and I’m a Facebook stalker. Coffee and Wine. When people ask me how I do it, my answer is coffee. I don’t sleep much. I did. But then November came and sleep went out the window. Then there’s wine. Wine needs no explanation. I’m also thankful for wine. And friends who drink wine with me. And Brian who buys me wine and who bought me 2 awesome new wine glasses (and explained to me that they weren’t both for me). Doctors, Nurses and Other NICU People. I’m still thankful to everyone who took care of the boys in the NICU at both UAMS and ACH. I can never express my thanks in words. I’m not good with mushy stuff. I don’t really share my feelings. But seriously I am forever grateful for everyone who kept the boys alive and helped get them to where they are today. More Doctors and Medical People. Now that we’re 19 months old, I’m also thankful for the rest of the people at ACH because we’ve seen A LOT of them. Outpatient clinics, ER, and inpatient units. Unfortunately we’re regulars up there. But I realized over the last month during our 2 hospital admissions and a 3rd trip to the ER that I’m never scared really. Don’t get me wrong, I still get sad and worried and I would still do anything if I could just switch places with whoever happens to be sick that day. But I have complete trust and faith that when I take my kids to ACH they will receive the absolute best care. Even More Doctors. And . . . I’m thankful for my mom’s doctors. As a kid you never think your parents are capable of getting sick. So when my mom got sick this year I was really scared. I think we were all really scared. I even took good news with reservation. 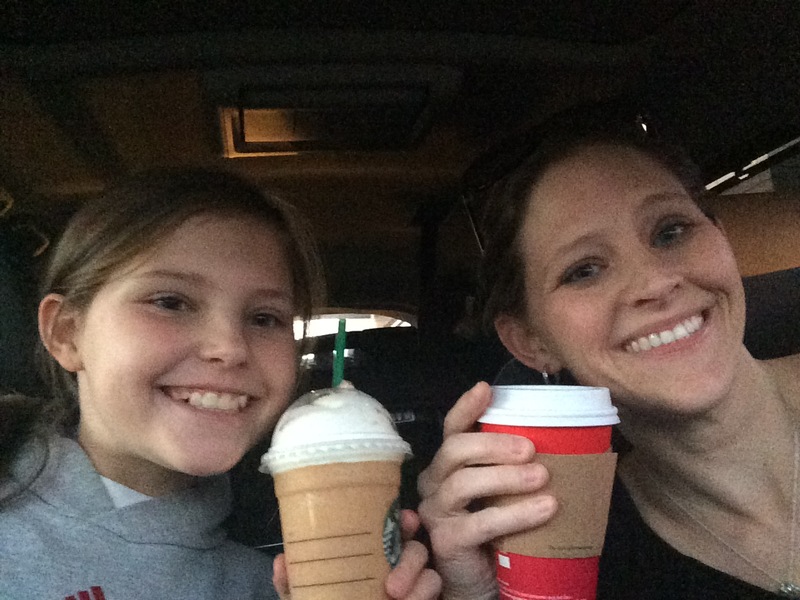 Until last week when we got the ultimate good news – remission. Yay! Go Mom! Work. This one is a repeat but I’m still thankful for my career. 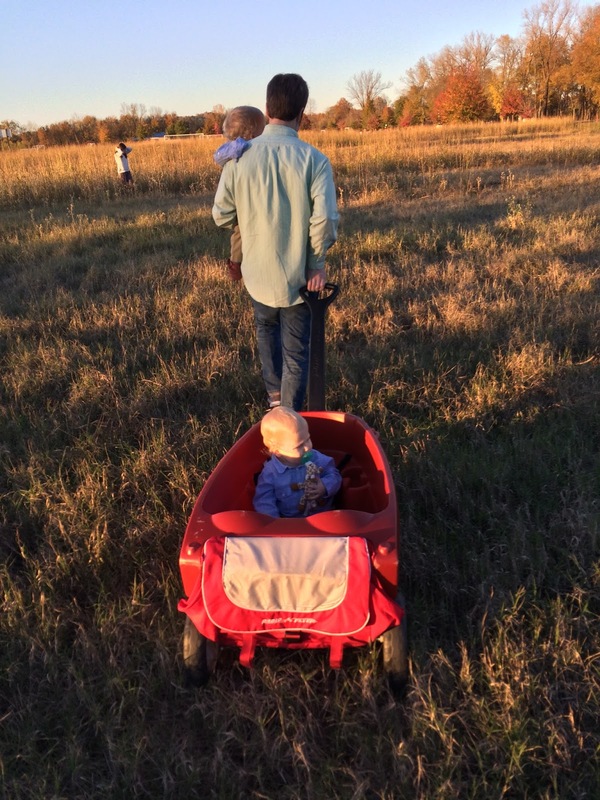 4 years ago when I was a baby lawyer, I stumbled into the most unique and amazing law practice that ultimately works perfectly for me and my family. I have the opportunity to work with 2 super smart lawyers who teach me so much. And they also care about me and my family. It’s not just about work. It’s a lot about work. But work isn’t the only thing. I know I have a unique thing going for me. And I get to wear jeans to work. Extra bonus. Chocolate. Oh sweet chocolate. How can I forget chocolate. Chocolate helps when coffee just won’t do it. So that’s my thankful list for this year. Simple – family, friends, coffee, wine, chocolate, doctors, and a good career. We didn’t celebrate Thanksgiving in the way we expected. But we didn’t skip it altogether. Logan came home on Thanksgiving. When we got home, Brian had made a little Thanksgiving lunch. Brian, the boys and I ate Thanksgiving lunch together at the boys’ table (and they stole all the food off our plates). 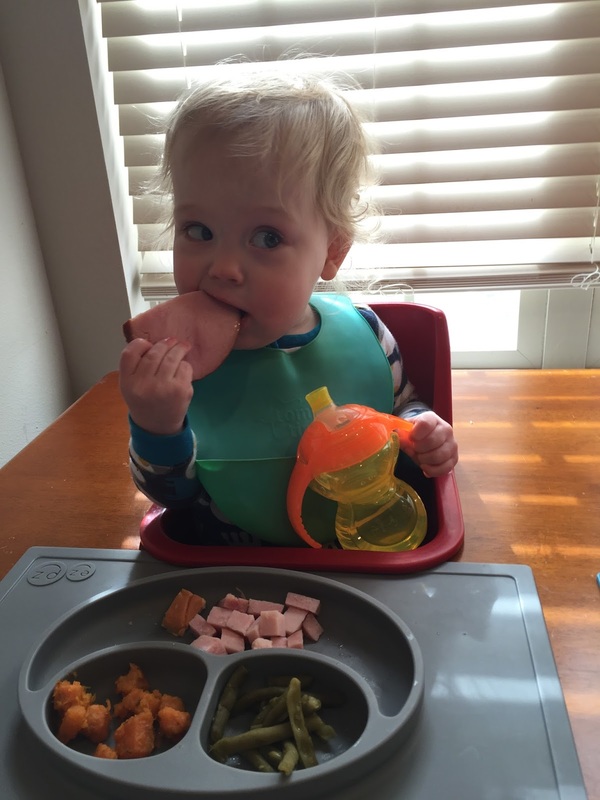 Mason loved the ham. Ha! The next night my friend came over and we had Thanksgiving dinner. Our original menu was mashed potatoes, brownies, and wine. Brian didn’t approve though so we added a few things. But still had mashed potatoes, brownies and wine. 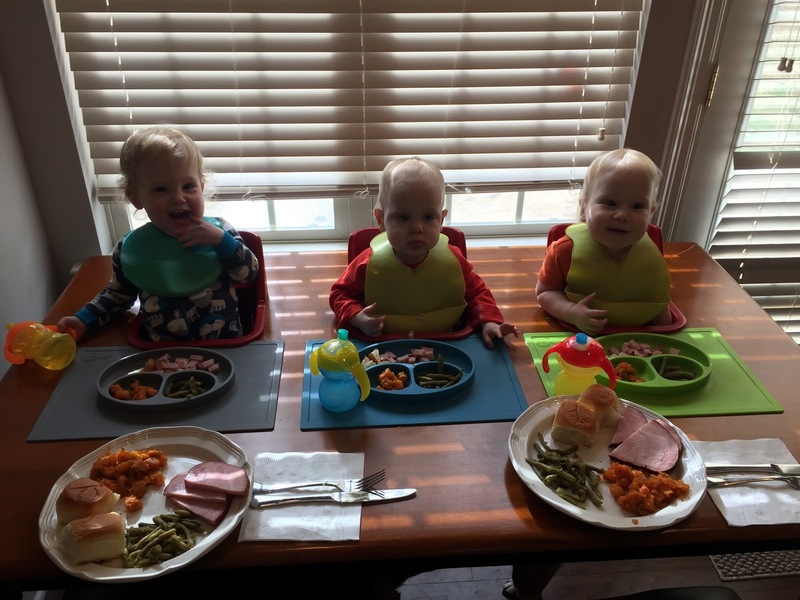 This entry was posted in Holidays, Thanksgiving, Triplet Milestones by Angela Mann. Bookmark the permalink.